OF CONSIDERABLE significance also to the bodywear sector is the announcement by Lenzing that its Tencel fibre is the first to have been tested by the Fördergemeinschaft Körperverträgliche Textilien e.V. 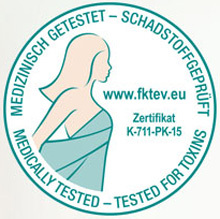 (FKT), which allows it to use the FKT label Medically Tested – Tested for Toxins. The label is a guarantee that textiles incorporating the fibre will not release chemicals that could irritate or cause a health hazard when in contact with the skin. Although the tests were made in connection with the promotion of Tencel in the field of bed linen, the guarantee of health and wellbeing applies also to all garments worn next to the skin.